This .45 ACP ammunition from Federal's American Eagle series offers quality target shooting for old and new handguns alike thanks to its standard pressure loading. 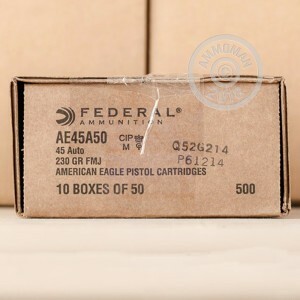 Each cartridge in this box of 50 fires a heavy 230 grain full metal jacket bullet at a relatively low muzzle velocity of 890 feet per second, producing stiff but manageable recoil. 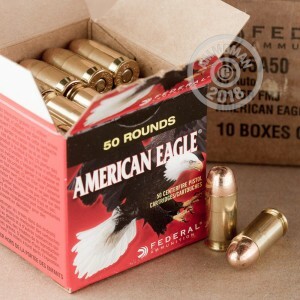 To help save you money (and trash hauling trips), this ammo uses trayless packaging. 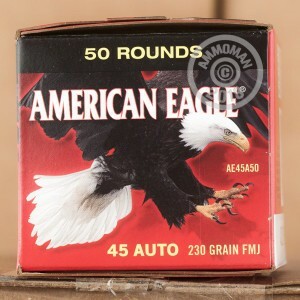 Like other Federal ammo, it is loaded in the USA and uses non-corrosive Boxer primers and brass cases. Place an order for more than $99 at AmmoMan.com and get free shipping--it's an amazing way to rack up double digit savings.